This medication is used with other medication (such as a sulfonamide) to treat a serious parasite infection (toxoplasmosis) of the body, brain, or eye or to prevent toxoplasmosis infection in people with HIV infection. Pyrimethamine belongs to a class of drugs known as antiparasitics. It works by killing parasites. Take this medication by mouth usually once or twice daily or as directed by your doctor. Take this medication with food to decrease nausea and vomiting. If vomiting is severe or continues, your doctor may lower your dose or direct you to stop taking this medication. Your doctor will prescribe another medication (folic/folinic acid) to prevent blood problems caused by pyrimethamine. Follow your doctor's directions carefully. Drink plenty of fluids to prevent kidney problems if you are taking a "sulfa" medication with pyrimethamine. This medication works best when the amount of drug in your body is kept at a constant level. Therefore, take this drug and other antiparasitic drugs regularly, exactly as prescribed by your doctor. To help you remember, take it at the same time(s) each day. Dosage is based on the type of infection, your medical condition, age, and response to treatment. The length of time you will take this medication depends on your infection. Your dose must be carefully adjusted by your doctor to treat your infection and prevent serious side effects. Follow your doctor's directions carefully. Do not take more or less of this drug than prescribed. Do not stop taking it before completing this prescription unless directed to do so by your doctor, even if you feel better. Skipping or changing your dose without approval from your doctor may cause the amount of parasites to increase, make the infection more difficult to treat (resistant), or worsen side effects. What conditions does Daraprim treat? Nausea, vomiting, and loss of appetite may occur. If any of these effects persist or worsen, tell your doctor or pharmacist promptly. Some people using this medication may develop serious side effects including blood problems, especially at higher doses. This risk can be reduced with the use of folic/folinic acid and regular blood tests. Tell your doctor right away if any of these symptoms occur: easy bruising/bleeding, signs of serious infection (such as high fever, severe chills, persistent sore throat), signs of low red blood cell count (such as severe tiredness, pale lips/nails/skin, fast heartbeat/breathing with usual activities), swollen/painful tongue. Get medical help right away if you have any very serious side effects, including: bloody/pink urine, chest pain, slow/fast/irregular heartbeat. List Daraprim side effects by likelihood and severity. Before taking pyrimethamine, tell your doctor or pharmacist if you are allergic to it; or if you have any other allergies. This product may contain inactive ingredients, which can cause allergic reactions or other problems. Talk to your pharmacist for more details. Before using this medication, tell your doctor or pharmacist your medical history, especially of: seizures, kidney problems, liver problems, a certain type of low red blood cell count (megaloblastic anemia due to low blood folate), low folic acid levels from other conditions (such as malnutrition, problems with absorption of food, alcoholism), low red/white blood cell counts, low blood-clotting cell (platelet) count. During pregnancy, this medication should be used only when clearly needed. Discuss the risks and benefits with your doctor. Folic acid is very important during pregnancy. Your doctor will prescribe folic/folinic acid to prevent low folate levels. What should I know regarding pregnancy, nursing and administering Daraprim to children or the elderly? Some products that may interact with this drug include: lorazepam, penicillamine, sulfa drugs (such as sulfamethoxazole), drugs that can lower folate levels (such as phenytoin, trimethoprim), drugs that can lower blood counts (such as proguanil, zidovudine, chemotherapy including methotrexate, daunorubicin, cytosine). Does Daraprim interact with other medications? If someone has overdosed and has serious symptoms such as passing out or trouble breathing, call 911. Otherwise, call a poison control center right away. US residents can call their local poison control center at 1-800-222-1222. Canada residents can call a provincial poison control center. Symptoms of overdose may include: abdominal pain, severe/repeated vomiting, vomiting blood, seizures, slow/shallow breathing, inability to wake up. Laboratory and/or medical tests (such as complete blood count, liver blood tests) should be performed periodically to monitor your progress or check for side effects. Consult your doctor for more details. 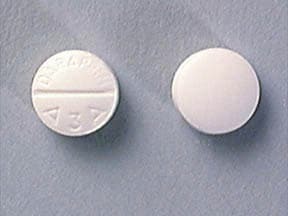 This medicine is a white, round, scored, tablet imprinted with "DARAPRIM A3A". Are you considering switching to Daraprim? How long have you been taking Daraprim?